We are looking at a Albin 40, 1985,,,is this damage structural,? and how concerned should i be.. The owner stated it was caused by the wet anchor rode? Have similar damage...mine drained into the bilge but the drain tube got clogged and I cant even ram it out. So I just drilled a 1/4 inch hole in the lowest spot to the exterior of the hull and covered it with a clamshell like many boats. I also made a 3 inch deep fiberglass pan inside the bottom of the locker so moisture cant come out in the vee berth area. The bulkhead is an easy fix...but check for rot around the Sampson post. Might be fine as much of the solid teak in my Albin is still sound structurally, just the veneer is bad. see my other post in your other thread....if it is that bad, adjust the offering price....but there were about 10 spots like that on the boat I bought nd repaired them. The teak veneer on my boat has pretty much separated over the entire interior of my boat. Welcome to the forum! The joys of boat hunting, always surprises. Probably just the veneer. Try the pencil test. Take a pencil, see how far it goes in. Most of my windows looked like this. Mine wasn't structural just an eye sore. Mine was also damaged by water "backup". I rebuilt mine making one side deep all the way to the bilge (for chain so it could fall in a decent pile) and the other side I left shallow (for rode). Mine still drains to the bilge, but the hose is much larger, hopefully it won't clog up. On my boat...the veneer is/was 4 plies. The teak plywood underneath is probably 1/2 inch and the veneers made it nearly 3/4 when all glued together so don't be surprised if it sinks in a 1/4 inch or maybe a bit more the stops dead. I only had 2 or 3 spots under window corners that the plywood was rotten all the way to the thin glass covering the house. The aft end of the master head window spread from the side of the aft cabin side to the athwartships bulkhead forming the after part of my head. It was no big deal to use a multi tool to dig it all out and epoxy blocks o ply in. The bulkheads need new covering so neat joiner work for the bulk repair wasn't necessary. 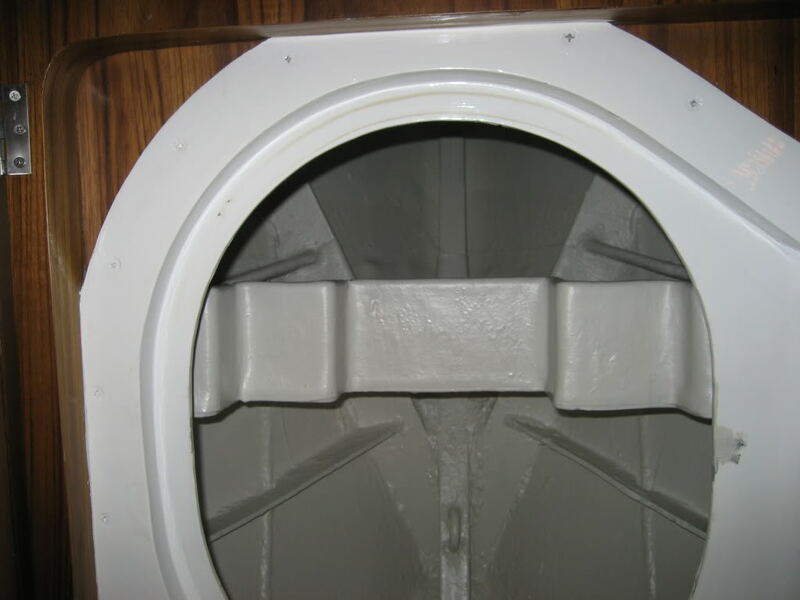 often this bulkhead is a very important "Collision bulkhead" so it must be repaired promptly. if the tree rotten and damaged it does not work stiffening, for example, in the big waves and may increase the damage hull. This is my vision of this water damage. its not a collision bulkhead on my Albin 40 .... and unless they changed something drastic from year to year I doubt that one is either. Mr. b. IF this area is the only one that is water damaged AND the Sampson post AND the surrounding deck area is in good shape I would not be terribly concerned. What's the source of the leak? My "leak" occurred when exceeding six knots resulting in water spouting from the locker drain. Solution was to install a tray higher up in the locker so the drain would be higher. water backing up from clogged drain.its a mute point ..he's asking too much..a 9 price for a 5 condition. .thanks any ..this is a great forum. Tons of boats out there, difficult but wise to walk away. I know its a "moot" point now but I can just about guarantee you would have been replacing a lot more wood there than it looks at first blush. Its not going to stop at one or two layers, no way. On my boat it was easy....most of the veneer peeled away easily...but not all of it. A little coaxing got the rest for a smooth layer underneath. One reason the rot or water damage didn't go any deeper was the contact cement seemed to be a pretty good barrier. So depending on the construction...the peel could be a layer or two...but no matter what...you go to good wood it a serious repair. I paid probably more than many would have for my boat...but between the new engine, load of good fuel (back when it was $4.00/gallon, a load of spare parts and it was the only layout I liked in a boat I could afford. ...yes I did a lot of repairs...but in some ways it was the only way to get what I wanted....keep that in mind too.